Two wild salmon fillets, both alike in dignity, pan-sautéed with an almond-meal dredge, sauced with summer fruits and perched atop a bed of grains. But here the parallels end (and the sad, slight references to great works of literature, I promise!). The first dish uses my take on the classic veronique sauce of white wine, cream and green grapes. Jeremy had asked for grapes from the farmer’s market and I told him that it wasn’t likely, as I had never seen grapes sold there in previous years. But I was glad to be wrong—this year there were at least two booths selling grapes next to the pears and the last dregs of the summer berries. The ones I got were very small and seedless, and I kept looking at them in the refrigerator when I reached in for the salmon. Initially I was thinking of some sort of white gazpacho-based sauce, thickened with breadcrumbs and almonds, but in the end that just sounded too summery for a meal in late September, so I pulled out the shallots and cream instead. As a nod to my original idea, however, I chose to dredge the salmon in almond meal before sautéing, as opposed to the more traditional poaching method for this recipe. The finished dish was alright: Jeremy liked it, but I really felt like the flavors weren’t harmonizing for some reason. Two days later I needed to use up the rest of the salmon. Part went to more gravlax—this time using smoked salt and no herbs, for a different flavor—and the rest became a vehicle for golden tomatoes. 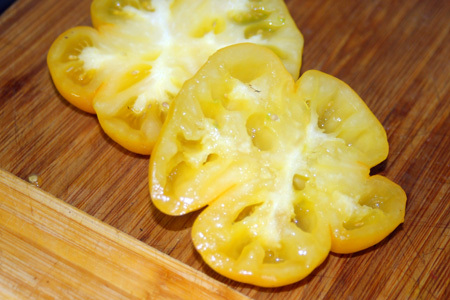 I had two large yellow heirloom tomatoes, three orange Roma-lookalikes (another heirloom variety, whose name I didn’t catch), and a double-handful of sun-sugars, plus a yellow bell pepper that was starting to go soft. All of these went into the oven at 500F, spritzed with oil, and roasted until they burst and browned up on top, about 20 minutes. I threw in half an onion and a few fat cloves of garlic for good measure. After they cooled a bit, I ran the lot through my food mill, leaving the seeds and skin behind and ended up with about 2 cups of burnished orange puree. 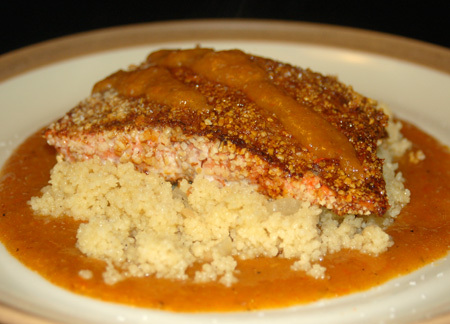 This time around, the salmon got a Moroccan-inspired spice rub before being dredged in almond meal (with b’stilla, rather than white gazpacho, in mind this time). I cooked up some couscous with onion, garlic, and ginger, stirring in a few capers at the end, and gently rewarmed some of the tomato puree with a spoonful of honey and a bit of cinnamon. The colors of this dish just scream autumn to me, and the flavor was excellent: rich, tangy and aromatic with just the right hint of sweetness, with the fluffy couscous and crunchy nut coating providing contrast against the silky foil of that puree. I only used up half of the tomato puree in saucing dinner, and am hoping to use the rest for soup this weekend, maybe with grilled cheese sandwiches on my sourdough bread. For the salmon: Rinse fillet, pat dry and cut into 2-3 portions. Sprinkle with salt and pepper on both sides, along with any other herbs or spices that might complement your chosen sauce. Tarragon or herbes de provence might be appropriate to go with a veronique sauce, for instance, or a Moroccan spice blend (I used a mix of sweet paprika, cinnamon, ancho powder, cumin and garlic powder to go with the tomato coulis; a little heat would not be amiss in the blend if you like that sort of thing). 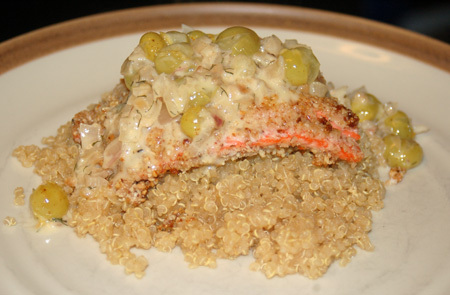 This can be done in advance and left to marinate in the refrigerator for several hours if desired, or used right away. When ready to cook salmon, grind almonds to a fine powder in a blender or food processor, being careful not to over-process them into almond butter. Pour out into a small container and dredge the salmon fillets in it, pressing firmly to adhere as much coating as possible to the fish. Heat a non-stick skillet over medium heat, add a few tablespoons of olive oil, and add the salmon gently. Cook until golden brown on the first side, about 3-5 minutes, then flip and cook until done to your liking. If your salmon is on the thick side, you may want to turn down the heat slightly to prevent the almond coating from burning while the fish cooks through. For the veronique sauce: In a skillet over medium heat, sauté the shallot and garlic in the butter until fragrant and tender. Add grapes and the dill or other herbs, and cook just for another minute or two. Pour in the wine and allow to reduce by half, then stir in the cream, and reduce slightly to thicken. Taste and adjust seasonings before serving over the salmon. For the Moroccan tomato coulis: In a small saucepan, combine the roasted tomato puree (method below) with the honey, cinnamon and garlic. Warm gently over medium low heat and adjust seasonings to your taste. The composition of your tomato puree will effect the sweetness or tanginess of the end result; you may want to add a bit more honey for sweetness, or if you use particularly sweet or low-acidity cherry tomatoes, you may want to add a splash of sherry vinegar. Mine just wanted a good dose of salt to amplify the other flavors. 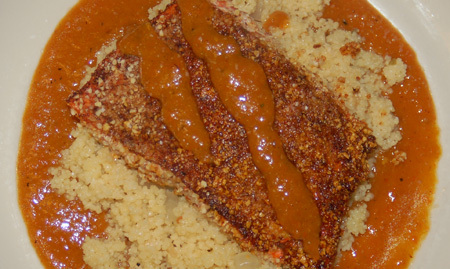 I also considered adding some fresh ginger to this coulis, but ended up putting some into my couscous instead. For the roasted tomato puree: I didn’t really use measurements for this; I oiled a non-stick pan and filled it with quartered heirloom tomatoes and whole cherry tomatoes, plus a seeded bell pepper, about half an onion (cut into wedges with the root end intact), and two fat garlic cloves with their papers on. You could use any similar combination of vegetables; my tomatoes and peppers were all yellow in this case. Tossed with salt and a bit more oil, they roasted in a preheated 500F oven for 20 minutes or so, until everything was deeply browned/caramelized on top and very juicy underneath. I had enough vegetables to fill a 9×13 casserole one and a half times, but you could use as many or as few vegetables as you have on hand. Once my veggies cooled a bit, I dumped them all in my food mill, which strained out the seeds, skins and charred hunks, and left me with about 2 cups of puree, suitable for making this coulis, and/or any number of tomato-based soups and sauces. I’ve never tried almonds with salmon…sounds great! And so do those PB/chocolate/banana muffins!! !